There’s no snow on the ground. The sun continues to shine more often than not. Temperatures remain tolerable, to say the least. Despite all that, it’s time for the winter sports seasons to open around the area and across the state. To prepare you for the action, you will find our 2011-12 Winter Sports Preview inserted in this edition of the Albion News. The Boone Central Cardinals get their campaigns rolling with a busy weekend slate. The Boone Central wrestling team travels to David City Aquinas for a dual Thursday, then treks to O’Neill Saturday for its first tournament of ‘11-12. The Cardinals girls and boys basketball teams will tip of at home Friday against Mid-State Conference rival Hartington Cedar Catholic and travel to Columbus to face Lakeview Saturday. 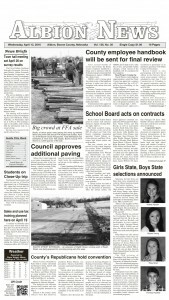 The Cedar Valley Mavericks also open the 2011-12 basketball season at home, hosting Clarkson at Cedar Rapids Thursday. 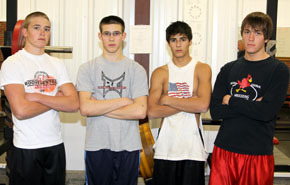 The CV wrestlers get started Friday at the Ravenna Invitational. Lindsay Holy Family will have a court doubleheader on opening weekend, as the Bulldogs and Lady Bulldogs travel to Humphrey St. Francis Friday and host Newman Grove Saturday. The Jay cagers entertain Fullerton in Newman Grove Thursday, while the Newman Grove/Holy Family wrestlers debut in the Broken Bow Invite Saturday. 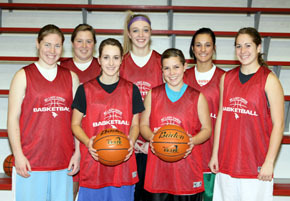 Spalding/Spalding Academy will open the basketball season Thursday, hosting Heartland Lutheran. St. Edward’s girls and boys host Nebraska Christian for court action Friday, then travel to O’Neill Saturday to face St. Mary’s. Complete team schedules can be found in the preview section, along with team photos and preview articles.